Your home garden may be in danger of distress if you leave your birch trees vulnerable to winter temperatures. Due to rapid changing of environmental conditions within a short period of time, your birch trees can suffer considerable damage from frost crack. Determine an efficient method of protecting your tree from the colder months to avoid the subsequent problems that arise when cracks form. Frost crack in birch trees often occurs on trees that are already stressed. Keep your trees vigorous by adhering to appropriate care requirements to avoid cracking problems. 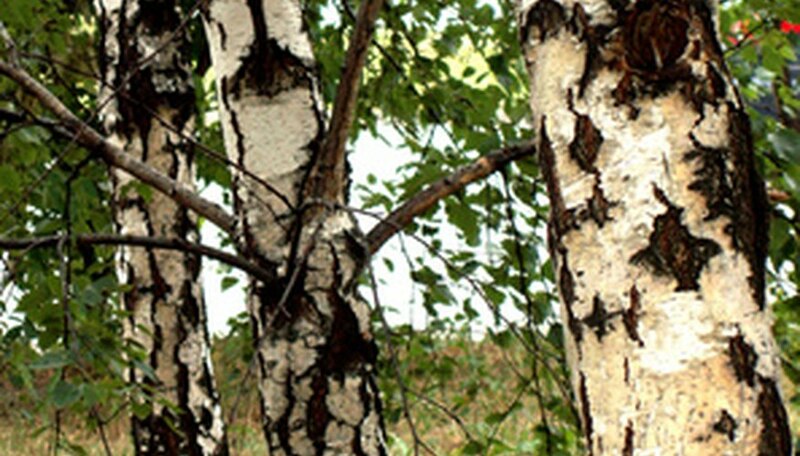 Grow birch trees in locations that offer full sun to partial shade. Grow in preferably moist, well-drained soil with a pH of 5.0 to 6.5, advises the United States Department of Agriculture. During the end of the winter season and the beginning of spring, temperatures swing up and down, dipping into freezing night temperatures that warm up during daytime hours. When temperatures change drastically within a short period of time, like the cycle of a single day, the water within the tissue of the birch tree expands and constricts in natural response to the changing temperatures. The quick changes in the diameter of the internal wood and bark often results in a crack because the tree does not have a means by which to compensate for the sudden expansion, according to the University of Minnesota Extension. It is thought that trees that experience frost crack have often already incurred an injury. Frost cracks on trees run vertically and can measure over 3 feet in length, according to the University of Tennessee Extension. Cracks are found on the southwest portion of the birch tree, and while they usually do not kill trees, they place a tree in decline. Your birch tree will heal on its own unless the crack is caused by a more severe underlying problem. However, to aid trees in their recuperation, you may increase the healing rate and jump-start the production of new growth by carefully cutting away loose bark around the crack with a sharp, sanitized cutting tool. Protecting your birch trees from freezing winter temperatures increases the likelihood of avoiding frost crack. Cracks often occur due to a similar condition called sunscald during which the sun warms tree trunks that quickly become cold during freezing night temperatures. To deflect sun, wrap your tree trunk with a light-colored material or a store-bought guard. You may also apply a white paint formulated for tree use to avoid daytime heating from the sun. Additionally, avoid creating wounds during pruning that injure the tree, leaving it more susceptible to frost crack, according to the University of Tennessee Extension. The wide variety of birch tree species have varying levels of cold hardiness. When planting a birch tree, verify that you have chosen a tree appropriate to your region to avoid problems. Trees in decline are vulnerable to other problems like pests and diseases that seek out weakened trees and invade through cracks. Even if your birch heals itself, subsequent problems may diminish your tree's vigor after injury, according to the University of Tennessee Extension. Provide consistent tree care and examine your tree often after frost crack to check for any other issues that may arise.